Once, thought to be one of the invincible Himalayan peaks of the Arwa Group, Arwa Tower is now one of the most anticipated climbing expeditions for adventure aficionados. Arwa Tower is situated in Chamoli district of Uttarakhand. Recognized by its needle-like peak, the tower is edged by several buttresses. The base camp of Arwa Tower is situated at an altitude of about 4350m above sea level and can be trekked from Badrinath. So far a less frequented climb, Arwa Tower along with offering adrenaline rushing experience proffers unprecedented views and over-the-top feeling. Upon arrival at Delhi airport, you will be greeted with our representative and then further will be transferred to the hotel for the overnight stay. After the breakfast, we shall take you to Indian Mountaineering foundation (IMF). Here, a meeting will be arranged for you with the climbing expert. Overnight stay at the hotel in Delhi will be arranged. After the breakfast, we will drive to Rishikesh via Haridwar. Lunch will be provided en route. Upon arrival at Rishikesh, check-in at the pre booked hotel. Evening will be left free for you to explore the nearby places on your own. Overnight stay at hotel. Drive to Joshimath via Devprayag after early breakfast. We will stop for a short visit to Devprayag, where Rivers like Bhagirathi and Alaknanda meet to form the sacred river Ganga. 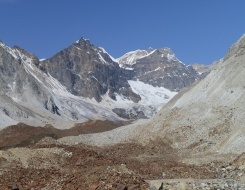 By evening, we will arrive at our destination, Joshimath and shall check-in to the hotel for dinner and overnight stay. We shall be taken to forest/National Park office for mandatory documentations. Overnight at the hotel in Joshimath. In the morning after breakfast we will drive to Badrinath. On arriving at Badrinath, you will be taken to the pre-booked hotel. In the afternoon, we shall be meeting our climbing expedition crew like Guide, Cook, Porters etc. Overnight stay at hotel. After visiting the temple in Badrinath early in the morning, we will be driving to Mana Village (3 kms). From Mana Village trekking will begin to Ghastoli. The ascent is steep but is full of the scenic beauty. On arrival at Ghastoli, we shall set our camp for overnight stay. Day 8 Ghastoli - Arwa Tal (16 kms / 5-6 hrs). After breakfast we will trek to Arwa Valley, which is steep ascent trail. On arrival in Arwa Valley, we shall set out camp for overnight stay. From Arwa Valley, we will be trekking to Arwa Tal, which is the base camp for Arwa Tower. Today, we will be trekking from Arwa Tal Base Camp to Advance Base Camp for Arwa Tower. You will be given a day off to rest and acclimatize. It will take at least 19 days to complete the Arwa Tower climbing expedition. After reaching the Advance Base Camp, we will begin our back to Base Camp. On arrival at Base Camp, overnight stay will be arranged here. After the breakfast, we shall trek back to Joshimath via Badrinath. Overnight stay at Joshimath. A drive to Rishikesh will be arranged for today. Overnight stay in the hotel at Rishikesh. Drive from Rishikesh to Delhi via Haridwar. Overnight stay at hotel. In the morning after breakfast visit the IMF for debriefing and later back to hotel for relax. Evening transfer to airport for international flight.